Plinius Hautonga review | What Hi-Fi? We’ve become great fans of Plinius kit over recent years. Its combination of a fast, dramatic sound with excellent timing is hard to resist, particularly when allied to fuss-free usability and impressive build. The latest integrated amplifier from the New Zealand-based specialist promises much, looking as it does like a scaled-down version of the company’s top-end Hiato integrated unit. We reviewed the Hiato back in our August 2009 issue, and it really is a stunning product. It also costs £7215. Take the Hautonga’s lid off – nine small Allen bolts on the top and four larger ones on the side – and it’s easy to see where the money goes. There’s a mighty power supply, neat circuit-board layouts and plentiful use of top-quality internal components. This Plinius’s feature count is pretty high for a product of this type. There are five line-level inputs with the option of accepting a signal via balanced XLR for the input marked CD. Make sure the toggle switch next to this solitary balanced input is set correctly; it’s possible to get a sound through the single-ended option, even if the toggle is set for balanced XLR. Do this and you’ll be disappointed with the results. Double-check the switch is in the right place before getting frustrated with the amplifier, recording or system. Most high-end amps tend to be line-only units for good reasons. Record players are less common these days, and the general trend has been towards outboard phono stages. These keep the phono signal – around a thousandth that of a CD player – well away from the potentially degrading effects of currents flowing through the rest of the unit. That said, Plinius’s expertise shines through with the phono stage built into the Hautonga. Used with our reference Clearaudio Innovation turntable set-up, it’s a relatively detailed-sounding circuit with a fine sense of life and dynamics. There’s not quite the transparency or openness of the very best standalone phono stages at around the £1000 mark, but it remains a perfectly good option for most situations (unless vinyl is your main source and your turntable costs more than this amplifier as a whole). So, how about the rest of the sound? It has the familiar Plinius character – agile and punchy, with the ability to extract the last percentage of excitement from just about any recording. It charges into a track like Eminem’s No Love, dishing out a full dose of attitude. There’s enough resolution to follow the rapid-fire lyrics and enough refinement to ensure the production doesn’t grate. Move onto something grander such as Tchaikovsky’s 1812 Overture and the Plinius responds with a hefty flex of its electronic muscle. The output is rated at 200W per channel – and the Hautonga sounds like it can deliver that and more. There’s an impressive sense of authority about the way it delivers large-scale dynamic swings, and also its heft at low frequencies. It’s a really impressive-sounding bit of kit. 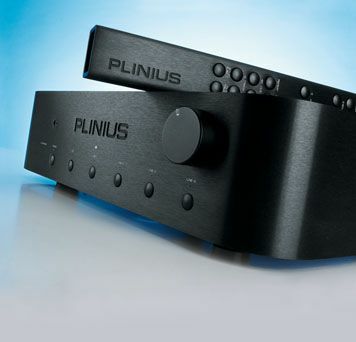 Yet despite that, we’re not quite as enamoured with this integrated unit as we have been with other Plinius amplifiers. That familiarly muscular presentation isn’t balanced by a large enough dose of finesse here – the Hautonga sounds a little heavy-handed for our tastes. It places too much emphasis on power and punch over delicacy, and that doesn’t work so well with gentler music such as the Impressions’ classic People Get Ready. The bass sounds a little unwieldy with music such as this, too. There’s no denying that the Hautonga is a fine amp. In respects such as power and authority it’s a match for just about anything at this price level. However, the are cheaper rivals, notably Leema’s excellent Tucana 2, that do the power thing almost as well, but have a lighter touch when required. We like the Hautonga a lot, but we’re not in love.